The start of the manga, we see pictures of Mitokado Homura, Sarutobi Hiruzen, Utatane Koharu, Akimichi Torifu, Shimura Danzo, and Uchiha Kagami. There’s a message that in Danzo’s final moments, he remembers vying with his friends for the title of Hokage. And so Sasuke, pierced Karin and hit Danzo straight to the heart. Madara said Danzo never had the chance to use Izanagi. Karin asks if this is all she is to him. Sasuke addressed Karin and said that she is nothing but a burden if she can be taken hostage. Karin fell and Danzo turned away. Madara immediately blocked his way and said that Shisui’s eyes is his now. Danzo remembered a younger version of him. He remembers being on a mission with the Nidaime Hokage. The Hokage was explaining that they are surrounded by at least 20 people from Kumogakure and that they are Master Bounty Hunters. Uchiha Kagami said there are only seven of them. Utatane Koharu said they don’t know their exact location yet and therefore, should wait for them and launch a surprise attack and thus give them a chance to escape. Uchiha Kagami said that will not work and someone will have to lure them away. Akimichi Torifu said whoever the decoy would be will not survive. Danzo remembers himself hesitating to offer himself as decoy. Then, Sarutobi Hiruzen said he’d do it, he will become the decoy. He jokingly said that they should not worry as he is clearly the best among them and will not die. Danzo is having an internal conflict. He could not bring a part of himself to take the challenge and realized a part of him is actually relieved. Sarutobi Hiruzen told Danzo to take care of the others. Danzo told him to shut up, said that he was about to volunteer and that Sarutobi should not act so great. Danzo said he’ll be the decoy. He said that his parents died as ninjas in battle and self-sacrifice is a ninja’s duty. However, Nidaime Hokage said that he will be the decoy. He told them that they are bright young flames who must protect the village. Danzo answered that he can’t because he is the Hokage and there is none greater than him in the village. The Hokage said that he and Sarutobi had always been rivals in everything but that what they need now is unity. He said they should not bring their personal squabbles into this. The Hokage said that it is true that he was slow with his decision but first they must look within and know yourself without losing your calm. He said that right now, they would bring danger upon their friends. He said there is no need for them to be hasty. He said that one day the time will come and they should stay alive until then. And speaking to Sarutobi Hiruzen, he said that he must protect those who have faith in him and who love the village, and train those whom he can entrust the next generation. He said that tomorrow, Sarutobi will become Hokage. Danzo was in shock and in his mind said that Sarutobi had always been one step ahead of him. 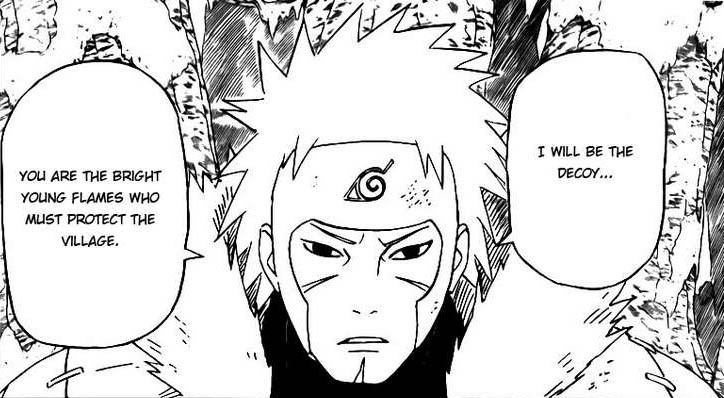 Back in the present, he told Madara that for the sake of the ninja world and Konoha, he cannot let him live. With that, he performed a Ura Shishou Fuuin jutsu, and his body exploded covering everything with blood. Madara shouted at Sasuke to get away from Danzo. With his last dying breath, he said to Sarutobi Hiruzen that it is his turn now but he never did become Hokage. He said no matter how far he went, he could never catch up to him. He said that like the yin yang, Sarutobi is like the leaves bathing in the sun while he is the roots that grow in the dark. 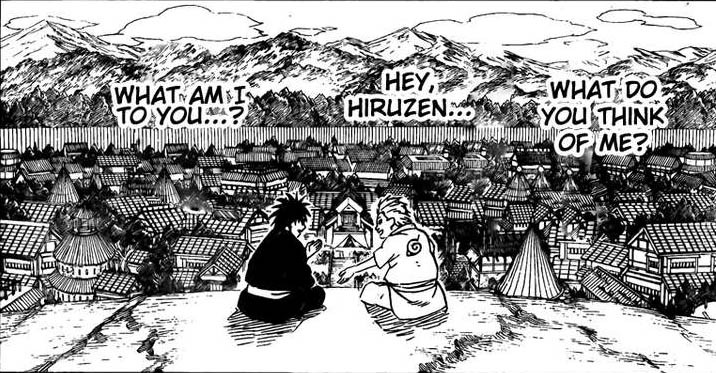 He remembered asking him what Hiruzen thinks of him and what he is to him. Meanwhile, Sakura, Lee, Kiba and Sai are on their way to search for Sasuke. 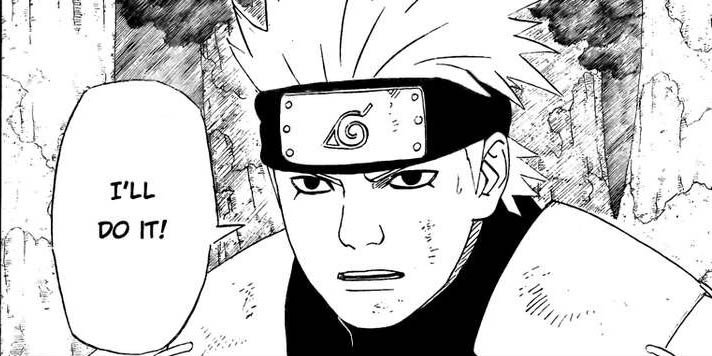 Lee asked Sakura if they ought to tell Naruto the truth. Sakura answered that there is no way he could tell Naruto the truth. Kiba said that she underestimates Naruto. 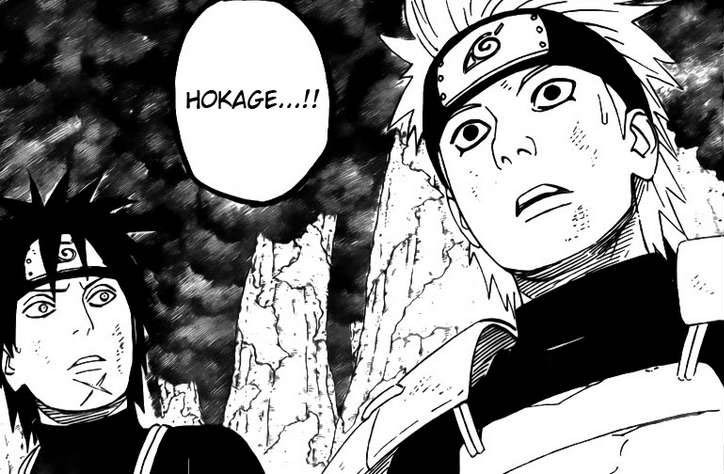 Then, just as Kiba said that, he said he’s found Sasuke and that Tobi is with him. Sakura asked everyone to stop. Kiba asked why they had to stop when they have all agreed on their formation. Sakura asked exactly how far away Sasuke is and Kiba said that he’s straight north, 2 o’clock, about 1 kilometer ahead. Sakura aplogized and about to throw a sleeping gas bomb but Sai beat her to it, holdng her hands. Sai said he knew she’d put them to sleep. Lee asked what is going on. Sai answered that it looks like Sakura wanted to take care of Sasuke on her own. Kiba and Lee asked why but Sai said he cannot let anyone pass. He said there is no way that they can beat Sasuke and Tobi by themselves and that he promised Kakashi he would not let them go. Sakura told him to get out of her way. Meanwhile, Madara explained that Danzo’s jutsu could have sucked them with his corpse and die with him. He said that he must have set it to go off when he dies. Sasuke replied that they are heading for Konoha next.